The weirdness of our situation of growing both apples and oranges struck me this week, first of all by seeing bananas still on our neighbor’s banana trees across the street, next by the 84 degree weather we had yesterday, and finally by the aroma of orange blossoms that is permiating the air while we’re grafting thousands of apple trees. I’m very much aware of the fact that others are in unheated barns right now trying to graft with cold, numb fingers, and so we’re very thankful. 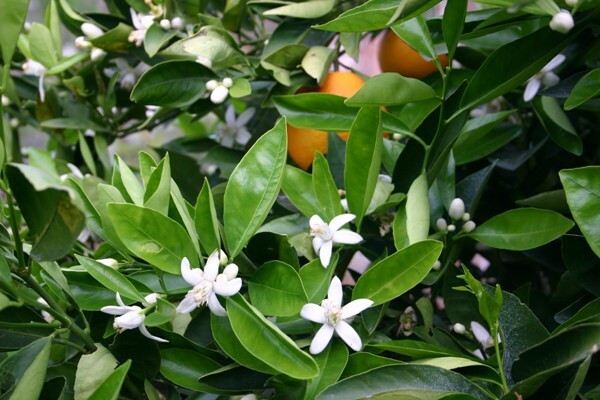 My mother-in-law still remembers when Riverside was carpeted with orange groves and said the smell during blossom season was all-consuming, overpowering you with giddiness and bliss. To me it is a harbinger of coming spring along with hearing the mockingbird singing all night (what’s up with that, anyway?). So I cut a sprig of orange blossoms and have them in a water bottle on the grafting bench while waiting for the beauty and much more subtle aroma of apple blossoms that are just around the corner. I have mixed feelings about the fruit set on our Minnie Royal and Royal Lee cherry trees; the blossoms did overlap but they’re about 25 feet from each other with nectarine and peach trees in full blossom between them. I can see how bees could get distracted and not cross-pollinating as well. On the other hand, this is the best cherry set we’ve had from it; not a bumper crop, but about 50 cherries on one and 25 on the other. We’ll see how they develop, but this is much improved over last year. I’ll graft branches from each other this summer to help the easily-distracted bees cross-pollinate them, and hope they reach full production in the next few years. 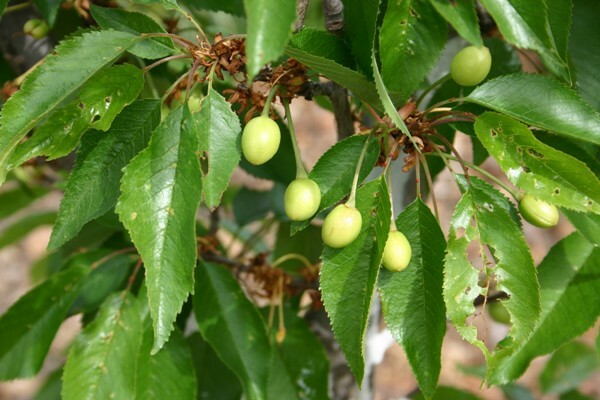 Still, cherries in lowland Southern California, who would have ever known?